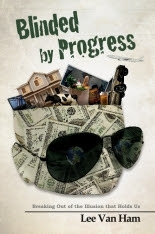 BLINDED BY PROGRESS IS HERE! SAN DIEGO, CA — Blinded by Progress by Lee Van Ham walks us smack into tough questions about our survival on this planet … and finds possibilities within our reach! Blinded by Progress takes us into the ring to tussle with these urgent, life-defying questions … and come out empowered with new thoughts and actions. A whole new worldview is spelled out. Reading it releases that “ah-hah” feeling we get when truth breaks in on us and breaks us out of illusion. Read it alone or discuss it in a group. The author discloses how he unwittingly came under the spell of MultiEarth living and then, as his consciousness shifted, how he began reshaping his life to OneEarth living—a project in process. Readers will follow along with the personal quest of the author, and come to new, life-giving decisions about their own MultiEarth vs. OneEarth choices. Blinded by Progress makes special contributions to the global conversation on sustainability now underway. The author clearly delineates the contrasts between MultiEarth and OneEarth worldviews. The chapter on the religious devotion given to MultiEarth economics and practices contains perspectives and content typically left out of conversations on the themes treated in this book. The power that myth has to keep us practicing the illusionary MultiEarth worldview is revealed by using John Steinbeck’s magnum opus, East of Eden. That novel’s use of the Cain and Abel myth provides bold guidance for our own MultiEarth-OneEarth choices. The concluding distinction between MultiEarth and OneEarth progress shows us how we got into our illusionary bubble and leaves no doubt that we have the power to choose differently. The personal journey of the author weaves in and out of the chapters, serving to illustrate the book’s themes, the subtleties by which MultiEarth progress blinds us, and the power to choose OneEarth’s satisfying ways. Lee Van Ham has been working on ecological economics since 2000. This work follows on three decades of experience in leading congregations where his writing and teaching gifts developed. In 2009, he met Michael Johnson; the two came together around their common interest in creating books and film on themes of ecology and economics. Johnson is an Emmy-award winning filmmaker who has begun work on a related documentary. Out of their relationship the OneEarth Project was born. About the author: In 1999, Lee Van Ham joined others in forming Jubilee Economics, a nonprofit focused in OneEarth living. Born to a tenant-farming family in Iowa, he pastored in the Midwest for 32 years before switching to work explicitly on the interplay between justice, ecology, economics, and spirituality. He and his spouse, Juanita, were part of the intentional community, Peaceweavings, in Chicago, before relocating to San Diego in 2002. They have grown children and five grandchildren. He desires to add to the conversations and actions that are moving civilization from empire to a living community with all of Creation.